Deep in the bowels of a secrative facility, something stirs. Long-dormant processors whir to life. Keys click on a keyboard as someone types furtively. 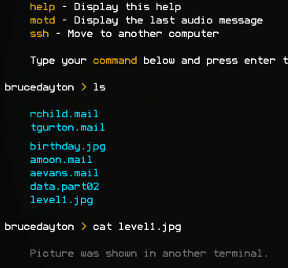 And a digital computer voice rings out: Welcome to Mu Complex, Bruce Dayton. Only it's not Mr. Dayton behind the keys, but you, as you step into the shoes of a hacker, in this enthralling game from Studio Cime, which is part text adventure, part riddle game, and part one in a projected series. Dive deep into the intranet of the secretive Mu Complex, virtually hopping from machine to machine, rifling through the files of its employees as you hunt for the links and the passwords that will lead you to more mysterious, more sensitive machines hidden in the heart of the facility. And there's no pointing and clicking here... You'll do it oldschool, by entering command prompts and toggling power supplies. Each file you uncover will tell you a little bit more about what Mu Complex is, and why you're hacking into it, but you won't be satisfied until you've uncovered the secret lying at its very heart. Seriously, you probably won't... Mu Complex is an absorbing and engaging adventure that will work your brain and hold you in its thrall until the very end. Going into too much detail about what makes Mu Complex so special would break its spell a little bit, as a great deal of the game's enjoyment comes from reading through the files, e-mails, and data pieces you uncover, and piecing together the story for yourself. But we can tell you that the game does have a superb atmosphere, excellently cultivated by its choice of medium. Learning specific text commands, entering them in, and eventually committing them to memory really does make you feel like a hacker digging their way through an antiquated machine. Learning what you capabilities as a programmer are, and learning when and where to apply them, makes for a surprisingly satisfying puzzle game experience all on its own. But soon, Mu Complex asks you to leave the safety of its game borders. When Mu Complex's riddle-game aspects come into play, you'll have to do a little research of your own, following the clues it leaves through Google, and into the real world beyond the game. Plenty of games incorporate trivia, but Mu Complex does it in a way that feels remarkably real. Its characters inject things personal to them into their computer systems and passwords, and using that info makes the game feel more real and makes them feel more real. If you have even the slightest love for puzzles, riddles, and good-old fashioned adventures, let yourself loose in Mu Complex. It's an adventure you won't soon forget. That unlocking sound is SO satisfying. OH WOW! This game is brilliant! I *LOVE* IT! Wow! Great game. Bring on episode 2! I don't want to spend money on this game, but I can't seem to find a free historical newspaper archive. entering the birth date puzzle. But I don't have a day of reference to go from or anything like that. What do I do? Leopardmask, keep looking. You're not going to find everything you need in one place. Man, thankfully I only needed 5 passwords. That ASCII one was really confusing me. Curse you, Steve Door! Start by typing "help" at the command prompt (no quotes). Type all commands in lower case. Go to the internet and search for Chicago Tribune archives. Look up Amos 5:23 in the Bible (NIV version). Note it references harps. Translate each note to a letter. Look up Luke 19:4 in the Bible (NIV version). Look up the hex color codes. That was a really great game. For some reason the backspace key didn't for me, I don't know if it is the game or my computer. So that was pretty annoying. solve all 6 puzzles if i wanted to, and I was sorely disappointed when the game just ended all of a sudden after 5. Do I really have to play the entire game over again to see the 6th puzzle? Other than that it was very enjoyable. Oh, duh, I think I was forgetting to type the file extensions on the other stuff so it wasn't registering and I thought I just couldn't access them. File extensions help. and finally gave up and looked at the walkthrough. Of course, it was the one thing I hadn't tried. Is that a message in Standard Galactic Alphabet? Or any actual language? It flashed too fast for me to go look it up or think to screenshot it, does anyone know what it says? Check the Wikipedia page about runes, specifically "Medieval runes (12th to 15th century)". It says "MU.DATABASE.STUDIOCIME.COM" which is a website with 5 other puzzles (already solved) that apparently unlocked the main game website (www.mucomplex.com). Enjoyable game, looking forward to the next chapter! Who would have thought that you could make a linux based escape game that IS AWESOME!??? I say escape game because you are moving through the local web of the MU Complex. Far better than the Jurassic Park Scene. This Saga Has Me HOOKED. 5/5 stars!!! PS, anyone know what Mapleton Utah has to do with this game? Also, did studiocime create that one song used at the end of the game? The second episode is already in production. Aw, yeah, this was a FANTASTIC game! :D I felt all super-spy, uber-hacker, awesome-kid. 'Mu Complex' reminded me of many games at the time I played it, but now that it's been a while, it's hard for me to remember all but one of them. Looking forward to replaying soon! I just started playing and saw that the OS in the game appears to be UNIX! :D Good thing I took that UNIX class last semester! This is a fantastic game! I'm replaying before I play the second one, and I was wondering if anyone knows what the files at the very beginning (manual.doc, help.pdf, and motd.bin) say? I can tell they're written in some sort of code, but I'm not sure how to break it. I haven't been able to make anything of the decoded numbers though. Well, that was fun. I'll be interested to see where episode 2 goes from here. lol i'm not christian so i would never have guessed the bible hints... that was a GREAT game, though. The game link no longer works, as the game has been removed from Kongregate, and now has to be purchased on Steam.